Marina, a little girl, loves to play pretend with her best friend Adam. They pretent what they will be when they grow up. Adam tells Maria that she cannot have a career like a doctor because girls can only he nurses. Adam is always telling her that girls cannot do certain things but Marina always proves she can. 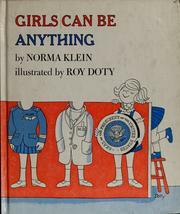 Klein, Norma, “Girls can be anything,” Children's Picture Book Database at Miami University, accessed April 21, 2019, https://dlp.lib.miamioh.edu/picturebook/items/show/8083.